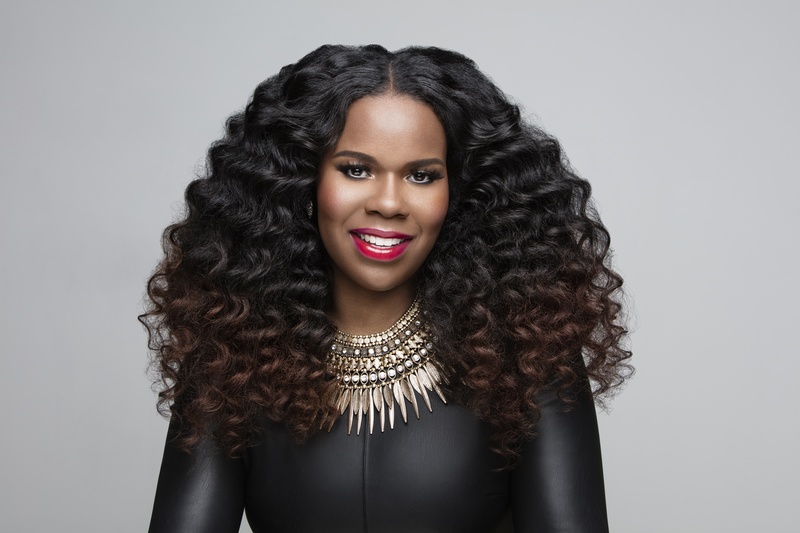 For many people, they know Courtney Adeleye as a healthy hair blogger, entrepreneur, and Founder and CEO of The Mane Choice. But, the story runs much deeper than that. If you are from Detroit like I am, you know that it was often hard growing up in a city of high economic struggle. But, I’ve always wanted so much more out of life than what I saw around me. At the age of 16, I began working at a local automotive dealership. I always mention this part of my journey because it is where I learned to hone my social skills and build close relationships with influential and motivated individuals. This ambitious environment shaped my mindset and character in such a way that I was driven to live a more purpose filled life. I went on to obtain my Bachelors of Science in Nursing Degree from the University of Michigan. And for anyone who knows me, you know I can’t stop there. I want it all! Shortly after completing my degree, I was soon faced with another challenging decision- to obtain my degree as a nurse practitioner or to fully launch The Mane Choice Hair Solution. While having a husband and 3 children would require plenty of sacrifice and many sleepless nights, I made my decision and The Mane Choice Hair Solution was born. BB: What would you suggest for a new Mane Choice user to create a consistent routine to maintain their hair month to month and get their hair growing and not shedding? I definitely go back to the deep conditioning that should be done every two weeks. For me, it can range from every two to four weeks depending upon what I am doing with my hair and how much heat I apply. I would not extend past four weeks. I’m also a big advocate of co-washing. Don’t be afraid of drenching your hair in water as often as you can. Kind of like a plant…if you water it, it will grow…and that’s true for any hair texture. With shampoo, be careful with what you’re using…for example, reserve clarifying shampoos ahead of straightening, as it strips the hair the most. Remember to examine your ends. Get trims as needed…based on the condition, not on a pre-determined schedule. BB: So, really: How did you even think of the concept of The Mane Choice? I decided to go natural several years back—seven, to be exact. I developed a passion for creating products for myself because I found it very difficult to find the right products to care for my hair. I did this for a few years and the word got out about my techniques on social media, because I showed women how to mix products to achieve desired results and provided tips on how to grow long, healthy hair. Also, I took the steps to eliminate all those texture-changing chemicals from my hair routine, and my business grew from there. I was actually creating at least five years before I officially started the company. BB: Whenever someone (mostly a woman) decides to build her own brand, people have so much to say. How do you deal with naysayers about the brand? Simple. I don’t. I would rather focus my devotion, time, and energy into building my brand to meet the needs of men, women, and children who want to simply find a solution to their hair care needs. That’s what the brand has always stood for and will continue to strive towards. BB: What has been the hardest part of building this brand? I don’t necessarily view it as a hardship but as experience through trial and error. When it comes to hair care, I definitely have to say that I don’t rely on someone else’s review of a hair product. I’m always going to try it for myself. There is nothing wrong with trial and error. I encourage people to use the information out there as a guide, not law. Be selective and digest what you can from adequate research. BB: So, how does Manetabolism Plus work for women looking to grow and maintain strong hair? It is important to note that our products aren’t just for women but were formulated for all genders, ethnicities, and hair types. As with every product, we took a medically, holistic developmental approach when formulating Manetabolism Plus—which are currently rated the #1 multicultural, healthy hair growth vitamin. They were designed with the healthy hair user in mind to work from the inside out. Manetabolism Plus is a supplement not just a hair vitamin. Aside from its primary focus to grow healthy hair, it also works to balance out vitamin deficiencies. While growing hair longer, thicker and faster is our motto, our proprietary blend is what truly makes Manetabolism Plus unique and gives us the ability to regrow hair follicles in inactive areas of the scalp. Manetabolism Plus works to nourish hair follicles, prevent hair loss, remove scalp toxins and speed up hair growth. They also work to improve the overall health of the hair and prevent breakage. Our vitamin stimulates the circulation on the scalp, thus improving the overall hair quality. By stimulating blood flow on the scalp, hair follicles become stronger, cutting down on hair breakage, hair loss, and thinning. BB: What really makes the Signature Pro a better way to straighten your hair? For starters, it gives our consumers a way to professionally style at an affordable cost. It is unlike any other tool in its class. Our Signature Pro flat iron not only talks to que on/off and heating/cooling announcements, but also comes equipped with a built in comb to allow for a one pass, silky, smooth finish. BB: What do you feel is next for The Main Choice? Growth in every aspect. We not only want to grow healthy hair, but we also want to spread the word that this is not a stark decision but so much more. The Mane Choice is a lifestyle that empowers, uplifts, and takes over!